Raise and Give is the fundraising event at TeenStreet. At TeenStreet, we love sharing the blessing and giving to people in need because God has given us so much. RAG is our way of sharing this blessing! Before and during every TeenStreet, we raise funds to support a good cause, usually within OM, that will positively impact youth in Europe. 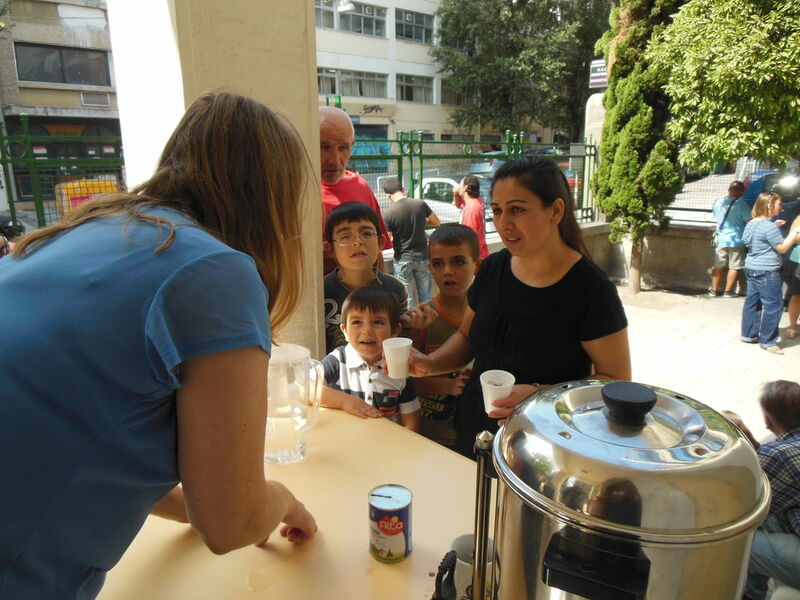 Last year, we did this by raising approximately 75,000 Euros for the "Vocation for the Future" project in Kosovo. Thanks to your generosity, we have been able to make a difference in the lives of young people in Kosovo in a way that wouldn’t have been possible otherwise! At TeenStreet 2019, we will be raising funds through RAG (Raise and Give) for projects working with refugee teenagers and children in Greece, Italy, and Serbia. Currently the teams in those countries can only offer basic help like tea/coffee, simple games, activities, and laundry, but they want to do more. We need your help! Backpacks, stationery, books, etc. and tutors to help with language learning. New sports and art equipment and contributions towards places to use them. Safe places where they can meet local teens and get to know Jesus, too. We also want to hear from you! Is there an activity close to your home that you could organise to help refugee teens living near you? Come along to the workshop at TeenStreet, get some help to put a plan together and then present your ideas. At the end of the week, we will see which ideas we can invest in. Whether you plan to run in the RAG race, perform in the talent show, or raise money in other ways, GOFOR IT— you will be making a difference! Now that you know, how can YOU help? Try out your best tips and fundraise to bring Hope for Refugees! Any money raised beyond the total needed for these projects will be used to fund similar projects in Europe. Thank you for getting behind this project – it really is bringing Hope to Refugees! Through this TSRAG2019 page you can set up your own TS RAG Fundraising page. This makes it easy for people to sponsor you online, it also makes tracking the total amount you have raised simple. Supporters from the UK who are taxpayers can also Gift Aid their donations (adding 25%). Once you have confirmed your registration and place as a TeenStreet 2018 participant, you then have the option to create a fundraising page for TS RAG Race 2018. Please just click on the "Fundraise" Box at the top of the page andcomplete the details on the form. You can use to use or edit our suggested text. Once your place is confirmed, the OM UK TeenStreet Team will send you a unique TS-link which you can forward to your potential sponsors. If they use that TS-link to register as your sponsor, they will be sent an email once you have completed the TS RAG Race 2018. This will let them know how much sponsorship they owe. They then need to go to your TS RAG Fundraising page and donate the amount owed for your sponsorship.